Got a Windows Phone? Know a bunch of people who also have Windows Phones? 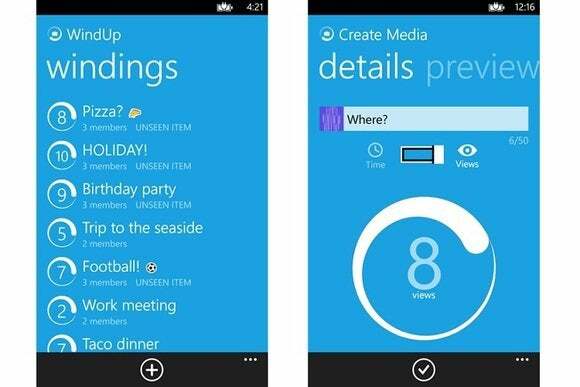 Then you might be able to use WindUp, a new messaging app from Microsoft Research. The app, which was first spotted by Neowin, supports text, pictures, and audio and video messages and is in the same vein as disposable messaging apps such as Snapchat. It works a bit differently, however, as messages don't simply disappear after they've been read. Instead, the sender can "wind up" either a time limit or a view limit for the outgoing message. WindUp's view limit is an interesting hook for groups of friends, as it encourages them to read and respond quickly. Those who lag behind may not be able to see the message at all. The problem is that WindUp is only available for Windows Phone at the moment, and it's unclear if it'll ever make its way to other platforms. And unlike Snapchat, there's no easy way to scan your address book for people who are already using the app. Unless you know which of your friends use Windows Phone, you'll have a hard time finding people to talk to. But as a little-publicized effort from Microsoft Research, WindUp may be more of an experiment than a proper attempt to get into disposable messaging. Given that Microsoft already has a messaging service in Skype, this might be the kind of feature that gets integrated down the road—or it may disappear as time winds on. Update: In a blog post, Microsoft dispelled the idea that WindUp is a competitor to Snapchat or other messaging services. "The application is designed to enable me and my team to explore patterns of content creation and exchange," Principal Researcher Richard Harper wrote. "It isn’t meant to compete with anyone else’s service, and it isn’t meant for commercial purposes."